Jonathan Liano, 38, of Sicklerville in Winslow Township, believed he was chatting with a 14-year-old girl he met online. However, the fifth-grade teacher had actually been sending sexually explicit messages to an undercover detective working with the Camden County Prosecutor’s Office High-Tech Crimes Unit (HTCU). The investigation began on September 4, 2018 when Jonathan Liano reached out to the detective, believing she was a teenager. The explicit conversations between him and the “14-year-old girl” eventually led to an agreed upon location where they could meet. On September 14, 2018, just before 4:30 p.m., Jonathan Liano drove to Pennsauken where he was met and arrested by law enforcement officers. Digital devices that were in Liano’s possession were seized by detectives and taken to Camden County Prosecutor’s Office HTCU for analysis. 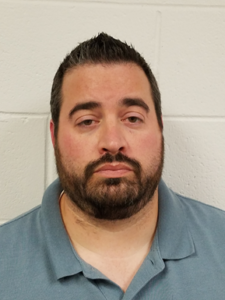 Jonathan Liano, a teacher at Dwight D. Eisenhower Middle School in Berlin Township, was charged with second degree Luring, according to Camden County Prosecutor Mary Eva Colalillo and Acting Pennsauken Police Chief John Nettleton. He was also charged with Sending Obscene Material to a Minor, Attempted Criminal Sexual Contact and Attempted Sexual Assault with a minor. Jonathan Liano was remanded to the Camden County Correctional Facility pending a pretrial detention hearing. Under Criminal Justice Reform rules, the court may order he be detained or released with conditions. These charges were the result of an investigation conducted by the High-Tech Crimes Unit of the Camden County Prosecutor’s Office and the Department of Homeland Security Investigations – Cherry Hill Office. The Camden County Prosecutor’s Office HTCU Detectives were assisted by members of the Camden County Sheriff’s Emergency Response Team (SERT) and the Pennsauken Police Department. Released Saturday, September 15, 2018.